Explore North Ward during your time in Townsville. It is positioned a kilometre northwest of the city centre. You may be amazed by the sheer number of fascinating animals that call the ocean home. ReefHQ Aquarium is dedicated to exhibiting this incredible diversity of fantastic creatures. Want to hit the hay not far from this place? Try the Mariners North Holiday Apartments and Quest Townsville. Inspect the artefacts and learn of the stories behind the region's rich nautical past at Maritime Museum of Townsville. 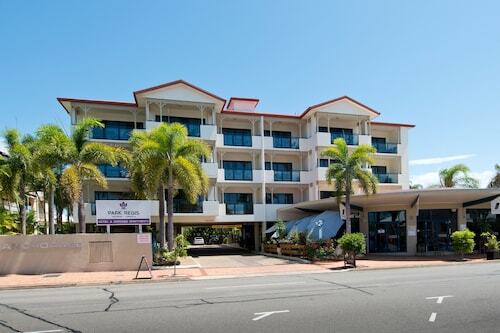 For this attraction, try the Grand Hotel and Apartments Townsville and Oaks Gateway on Palmer. At Wotif, we think it is important to splurge every now and then. So if you're visiting North Ward and you're in a position to spend a little more, consider the rates at the Quest Townsville on Eyre. You won't find it too hard to locate Reef HQ Great Barrier Reef Aquarium during your time in North Ward, just follow the smell of roasted coffee beans! As well as steaming hot drinks, they have plenty of tempting snacks to help keep your energy up. When your stomach starts thinking about dinner, go and take a look at A Touch of Salt. The entrées and mains may be delicious, but don't forget leave a bit of room for dessert! Don't stress if you cannot find the perfect North Ward hotel. You will discover more alternatives in the Townsville hotels guide and the Wotif Belgian Gardens hotels guide. Townsville is a kilometre from North Ward and Belgian Gardens is approximately 2 kilometres away from North Ward. There's no shortage of fabulous hotels and apartments in and around North Ward. So whether you're just looking for accommodation, or the whole shebang including car hire, flights and excursions, Wotif can make it all happen! How Much is a Hotel Room in North Ward? Hotels in North Ward start at AU$75 per night. Prices and availability subject to change. Additional terms may apply. We got a warm friendly welcome, and the hotel was close to lots of great places to eat and shop.